Help us expand the mermaid spotting map to include mermaids beyond downtown. *Many mermaids are on private property. Please do not trespass! Mermaids have graced the city of Norfolk for twenty years now. Norfolk attorney Peter Decker (1936-2012) - known as “Uncle Pete” throughout the community - introduced the idea of Mermaids on Parade at a breakfast with 300 business and civic leaders at Nauticus on November 30, 1999. The idea is credited to his wife Bess who was inspired during a visit to Chicago at the height of that city’s Cows on Parade. Through a public/private partnership, the Norfolk community pulled off a major event - Mermaids on Parade - in a short period of time. It was a huge success with local sculptor Kevin Gallup mass-producing 130 fiberglass mermaid castings for artists to decorate. Business and community leaders from Norfolk and beyond “adopted” mermaids at $2000 apiece that were auctioned off during the event. Today mermaids can be found throughout downtown and in neighborhoods. Some old, some new. Some in front of businesses, schools, hospitals and some in homeowners’ yards. Some have had to be completely redone due to damage from the elements or unfortunately from vandals. Some have even disappeared. But one thing has remained since their appearance: they are truly loved by young and old, visitors and residents alike. If you spot a mermaid, please post with our #Mermaid20 and #NorfolkVA hashtags so she can keep track with her birthday photo album! Check out the Other Spotted Mermaids submitted by mermaid spotter Erin Thomas! 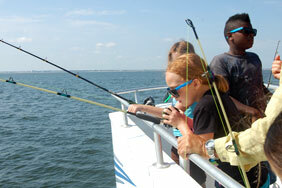 Mermaid spotter Michelle Fargo set out on a quest with her two sons in 2014 to find the Norfolk mermaids. 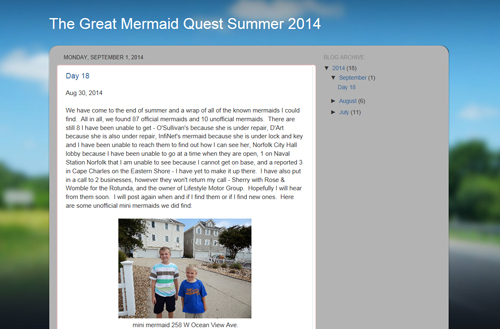 Visit her blog and see all the mermaids they found -- with updates!